This post will look in more detail at the remains we recorded and attempt to relate them to what is known about Field batteries from Manuals and War Diaries. Obviously we can only record what remains - some features may have disappeared (either due to woodland management work as the battery is sited on the edge of a small covert or perhaps the position may have extended into surrounding arable land so any features obviously long since ploughed up). Another factor to consider is that as this position was only occupied for a short while it may never have been completed. A Field battery position would have consisted of the gun pits, a command post, shell trenches and crew accommodation. Positions for close defence may also have been constructed as well as slit trenches for Passive Air Defence (PAD). The location would have been wired in. 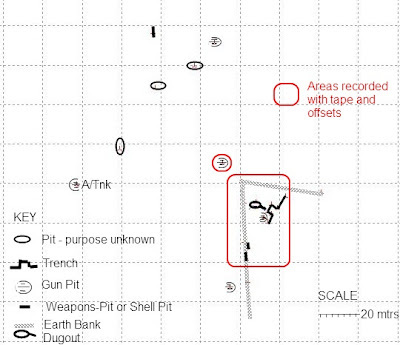 We recorded the area of the trench/gun pit/dugout and one of the other gun pits with tape and offsets. As always we seemed to have generated as many questions as we answered! Image 1: GPS plot with areas recorded by tape and offset highlighted. 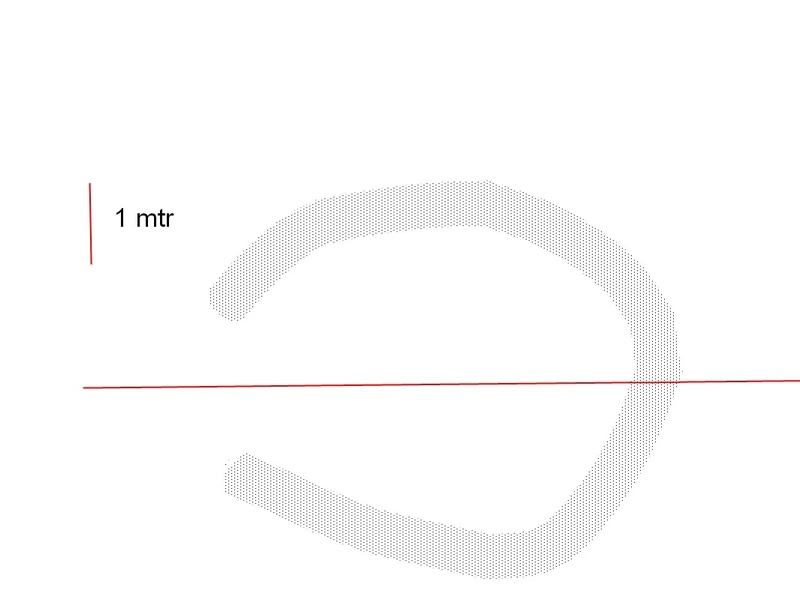 Image 2: Transect across the trench. Image 4: Transect across the dugout. The battery's task was to provide Defensive Fire. According to FSR Defensive Fire was "used against troops actually attacking. It is usually put down on pre-arranged areas in co-ordination with the fire of other weapons, especially of machine guns, and is fired on a pre-arranged signal". The guns would have been laid on their primary Defensive Fire task. Field batteries would have to be sited far back enough for a wide arc to be covered without changing the guns location. Field guns have a high muzzle velocity which gives them a long range but involves a comparatively flat trajectory. This means they would need to be sited so as to clear the crests of any high ground or obstacle between the gun and target. The position of this battery fits perfectly with the above - it is sited far back enough so it can cover both Walberswick and Dunwich (the battery's Defensive Fire tasks). 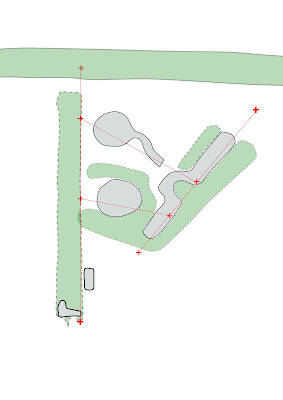 It is also sited on a piece of high ground ensuring "crest clearance". The battery is located on the edge of Forty Acre Covert which would enable concealment work to be kept to a minimum. At first it seems that the dugout and trench fit the illustration in the Field Engineering manuals of a command post quite well. The dugout is a typical 'cut and cover' construction which is entered from a narrow trench which probably had steps down into it. The trench is curved to provide some blast protection. But there is a problem with this being the command post - why site a gun pit so close? With a 75mm firing so close by, this is hardly a good position to receive reports and issue orders. There is no doubt that the remains we recorded are a dug out but perhaps not the command post. Perhaps this was a post either for close defence of the battery or as DS suggested to control anti-tank fire by direct observation? The more I think about this the more I like the anti-tank idea - the gun from this position would have covered a track leading directly to the battery position. 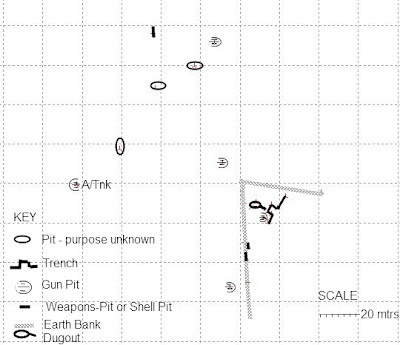 So perhaps the large pits marked on the GPS plot are also remains of dugouts which housed the command post? Guns would have to be aligned parallel for an effective barrage, but this does not mean the pits would have to be evenly spaced. This was discouraged as illustrated in FE Vol I - "In the study of ground from the air, regularity is invariably a sign of man. Regularity of spacing should be particularly avoided, and guns should be unevenly spaced as far apart as is compatible with control and the ground available". If we are right in our identification of the gun pits, this would explain the uneven spacing. 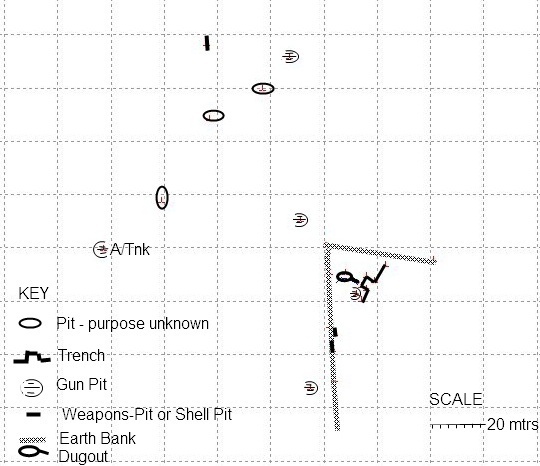 The War Diary of 129 Field Regt has some useful notes on gun pits. The gun should be dug down as low as possible - usually so the axle was at ground level. Typically this would be 2 or 3 feet. The protection of the pit should be about 5 foot, requiring a further 2 to 3 foot above ground. Sandbags may have been used to to make the pit proof against small arms fire.However the pit was not to be built higher than cover from view allowed; if insufficient cover was provided by the pit slit trenches should be dug sufficient for all the crew to be in them within 10 seconds. Overhead cover from view would be by a flat top cover (either string or wire netting) supported on a framework of poles.The two pits we ran tapes over are shallow excavations with perhaps a further foot of cover above ground. Sandbags may well have been added to provide extra cover. There seems to be a lack of slit trenches either for the crew or for storing the shells in . We would have expected some indication of remains of shell storage as guns in position to deliver Defensive Fire would have first line ammunition dumped at the gun positions (in several small quantities of not more than 50 rounds). Second line ammunition would be kept on wagons in case the guns needed to move to support the local infantry. One pit recorded on the transects may have been for storing shells but there is no indication of other slits at the other three pits. Part three of this post will look at the Tinkers Walks position which E Troop moved to in April 1941 - I found no remains of this position although it is easy to visualise it in the landscape. Also started to add some 1945 aerials to previous blogs, starting with the Diver Battery sites. Posting on this blog and the two websites has certainly slowed down over the last few months but this does not mean I've been idle - far from it! I've now completed my field work in the main Westleton training area, made another visit to the National Archives and also been carrying out recording in two other areas with David Sims. The next few blogs will detail the work on one of these locations. I stumbled on this site last winter, but as I am so far behind in converting cassini grid references could not tie it down to any locality in the War Diaries. However David was able to provide the answer - it is the position of a four 75mm gun battery . It is an interesting survival as earthworks related to actual Field Batteries are incredibly rare which is strange considering the number of practice gun pits that still survive in Suffolk. We have interpreted the remains as comprising a Battery Command Post, and at least two remaining gun pits (it is possible that all four remain). Stretching the imagination a little a fifth pit may have been dug to position one of the guns for an anti-tank role: "Guns must be prepared to engage tanks and where a road or other likely tank approach exists in the vicinity of the posn, a gun position must be reconnoitred and prepared (if necessary) to deal with tanks approaching along such a road etc." - HQRA 55th Div. First Image: GPS Plot of Field Battery Battle Position. Fourth Image: Could this pit have been dug as an anti-tank position? The pit is screened from view of the road except for the area in which the car can be seen. This position does not appear to have occupied for long. It is first noted in 52nd Field Regt's War Diary in Jan 1941, part of the artillery covering the front of 42nd Division. Work on the position probably commenced on 15th Jan 1941 when the War Diary notes "Regiment organised on a 2 Battery basis (205 battery - A,B and E Troops; 206 Battery - C,D and F Troops). Troops move into Battle Positions". The position we have found was the Battle Position of "A" Troop, 205 Battery. The War Diary notes that "Preparation of Battle Positions continues" throughout much of January. "A" Troop undertook firing practice on Jan 28th. 42nd Div were relieved by 15th Div during Feb 1941 and 130 Field Regt took over from 52nd Field Regt (with "E" Troop, 494 Battery taking over the position). 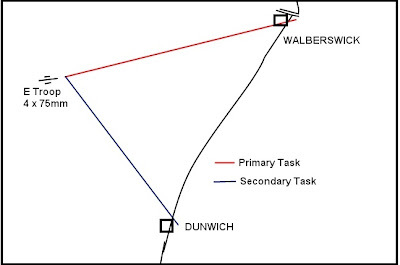 "E" Troop had a primary defensive fire task of Walberswick and a secondary defensive fire task of Dunwich. 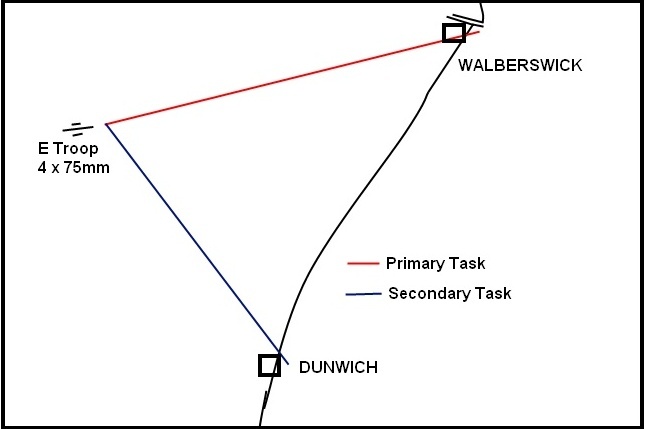 These tasks were almost at the maximum range of the gun (approx 7,500yds). RA 15th Division Operation Instruction No 28 dated 26th Mar 1941 detailed a change in gun positions "with a view of making available the greatest possible fire power available for A/tnk defence and siting Arty within defended localities". "E" Troop were to move to Tinker's Walks. This move was to be completed by 16th April. The next post will look in more detail at the remains and try and relate them to what information we can glean about Field Battery positions with reference to Field Engineering Manuals and War Diaries. Took a walk down to Shingle Street / Hollesley Marshes today. I noted that some scrub had been cleared around a couple of the pillboxes, so had another look inside. Although I've been in them before I noticed something new in one of them that relates to the title of this post. Surplus pillboxes for which no personnel are available to man after “stand to” constitute a danger should they be occupied by the enemy. The loopholes of all surplus pillboxes within two miles of the coast will be filled with concrete under arrangements of C.R.E. Commanders of No’s 1,2,3 & 4 sub-sectors will forward lists to this H.Q (copy to C.R.E) giving exact sites of all such pillboxes by 21 Apr 1941. Although the photos below show that this order was clearly carried out on this pillbox, there is dating evidence on the inside of two of the blocked embrasures I had not noticed before. On the inside a very neat job had been carried out blocking the loopholes with a rendered finish which the people carrying out the work had marked with "June 1941" and "Bristol Garland 1941" - not sure if that is a name or not! Above: Image 1 and 2 clearly show the loopholes have been blocked with cement as per Operating Instruction No 10. Images 3 and 4 show where the rendered finished has been marked with the date 1941. To finish off with a couple of more shots of pillboxes I have blogged on before at Hollesley / Simpsons Marsh but it is always nice to take new pictures in differing light / weather conditions! Top image shows a Type 22 with a flying buttress - Hollesley Marshes which has had scrub around it cleared since my last visit. Bottom image shows a Type 22 at nearby Simpsons Marsh with presumably the remains of the bridge that once allowed access to it. Note the screw picket in the foreground.